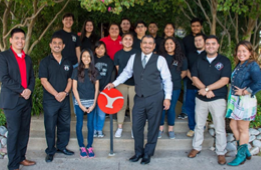 The Fort Worth Hispanic Chamber with the Diamond Hill Jarvis Robotics Team held a fundraising dinner back in late September which SHPE supported thru attendance and mentorship along with helping achieve 1k in grant funding in support thus far. Local High schools teams such as Diamond Hill and others need your support and help to continue in their fundraising efforts for registration costs, materials and travel in order to compete and raise STEM awareness in our local Hispanic community. Please consider making donations with the recently announced Lockheed Martin Match Program or see how you can volunteer to help these students be successful competitors in the year to come. SHPE’s logo will be displayed on the Robot as a proud sponsor of the ADAMAS team thanks to your efforts! Go to http://www.donorschoose.org/lockheedmartin to select a local school STEM project that inspires you. Please use your Lockheed Martin email address and enter the Lockheed Martin promo code: LMSTEM. For more information, questions, or volunteer opportunities reach out to Osvaldo Ramirez.